Replacement accessory pulleys for water pump and power steering pump that use less engine power, gains of 5-11hp. Kit includes new accessory belt. When you bought your BMW, you paid for a lot of horses... but are some of them stuck in the corral? 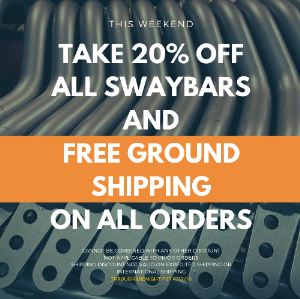 Take back that lost horsepower! A car's engine does many things other than just making the car move. Power is used to run the various accessories... things like the water pump, power steering pump, and alternator. All of these use horsepower, horsepower that is lost. Power that could be making the car faster. Each accessory uses rotary power - each accessory is turned to perform it's function, whether it's an electrical component (the alternator) or a fluid displacing component (the water pump and power steering pump). They all have a pulley which takes power from the crankshaft pulley via a belt. Some of the engine accessories take more power than they really need, dramatically affecting engine performance. Like an overprotective parent setting a curfew, there is a very big safety margin built into many systems of a BMW, especially in the accessories. Driving these accessories at higher rpm is a waste of energy, running it at a much higher rate than it needs to for optimum effectiveness. This is energy which could be put toward acceleration instead. An underdrive pulley is a replacement accessory pulley that bolts up the same as stock, but has a different size (ratio) and material specifications intended to free up lost horsepower. By increasing the diameter of each accessory pulley, the speed at which the accessories are turning relative to engine RPM decreases. Does this actually make horsepower? Underdriving the accessories does not add power to the engine, it frees up the power that is normally wasted on overdriven accessories. The theory is that a larger pulley will drive the accessories slower thus reducing their parasitic horsepower loss. No more power total, but more power sent to the wheels. As an additional benefit, the reduction in wear (less usage) on the accessories due to the lower duty cycles can extend the life of these parts. However, a look at each pulley-driven system under the hood will tell you why it isn't as simple as "just a bigger pulley". Which accessories can I underdrive? Of the four accessories that can be underdriven with a larger drive pulley, one is electrical (the alternator) and two are fluid pumps (the water pump and the power steering pump). The fourth is a compressor (the air conditioning unit). 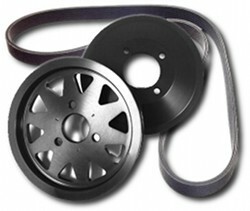 UUC Motorwerks Ultimate Underdrive Pulley set provides replacement pulleys for the water pump, power and steering pump. Please see the "Technical Details" page for more information. WARNING: Some companies have been marketing replicas of UUC's original pulley design, but advertising them as superior due to "light weight". This clearly shows these replica manufacturers do not have an understanding of the underdrive concept... weight reduction is not a factor in producing power with underdrive pulleys... the gain comes from reducing the accessory speed, not from less rotating mass. While some pulley advertisers do advertise "lightest weight", we feel that to be somewhat deceptive... in our extensive testing, we have proven that the actual weight of the pulleys is not a factor in increasing power gains whatsoever. Each pulley itself weighs just a few ounces... shaving off a small amount of additional aluminum will not make one single bit of measurable power. Weight savings in a BMW that are important are in the much larger rotating components such as a lightened flywheel or lighter road wheels. Why does UUC offer accessories pulleys instead of a replacement crankshaft pulley? 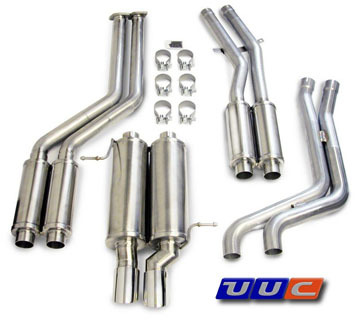 At UUC Motorwerks, our goal is improvement of the total performance envelope. We don't want to provide a product that is only appropriate to some cars and some circumstances. By using an underdrive system based on the accessory pulleys, UUC has the ability to fine-tune the specs of each pulley. None of the accessories on your car have identical operational parameters, why should the pulleys that drive them? The practice of removing your engine's crankshaft pulley in order to replace it with one of a smaller diameter does have a place in the performance tuning dictionary. However, it is important to note that the primary benefits from this modification are due to the decreased weight of the replacement crankshaft pulley. Regarding the underdrive effect, all the accessories see the same change in RPM - no fine-tuning available.